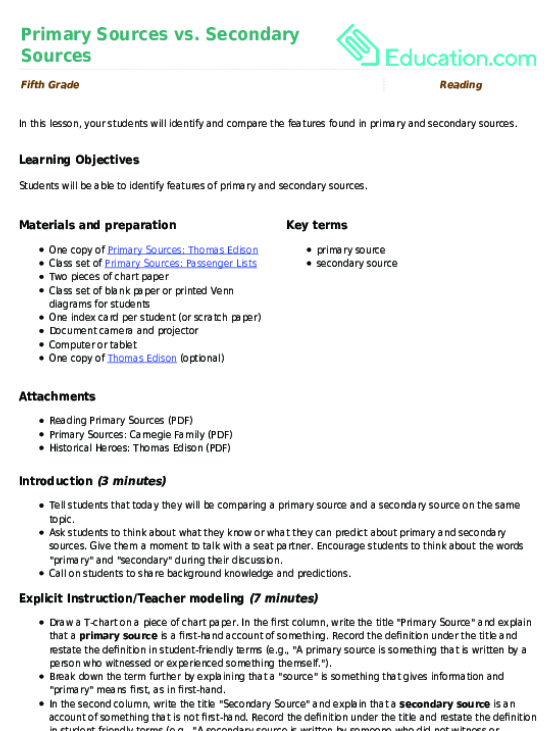 Students will be able to identify features of primary and secondary sources. Tell students that today they will be comparing a primary source and a secondary source on the same topic. Ask students to think about what they know or what they can predict about primary and secondary sources. Give them a moment to talk with a seat partner. Encourage students to think about the words "primary" and "secondary" during their discussion. Call on students to share background knowledge and predictions. Draw a T-chart on a piece of chart paper. In the first column, write the title "Primary Source" and explain that a Primary sourceIs a first-hand account of something. Record the definition under the title and restate the definition in student-friendly terms (e.g., "A primary source is something that is written by a person who witnessed or experienced something themself."). Break down the term further by explaining that a "source" is something that gives information and "primary" means first, as in first-hand. In the second column, write the title "Secondary Source" and explain that a Secondary sourceIs an account of something that is not first-hand. Record the definition under the title and restate the definition in student-friendly terms (e.g., "A secondary source is written by someone who did not witness or experience the thing they are writing about. A secondary source may cite primary sources, but it is not always written in the same time period or location that the event occurred."). On the T-chart record examples of each type of source (e.g., eyewitness account, diary, recorded speech, census data vs. textbook, magazine article, television documentary, biography). Invite students to volunteer other nonfiction sources and help them categorize each as primary or secondary before adding them to the T-chart. Optional: show students specific examples of each type of source (e.g., Anne Frank's diary vs. a nonfiction book about Anne Frank). 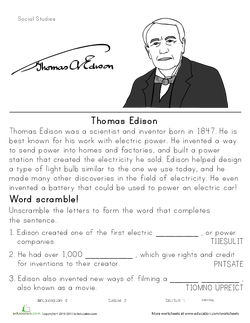 Tell students that you will be showing them an example of a primary and a secondary source about Thomas Edison. Read aloud the short paragraph at the top of the Thomas Edison worksheet to provide some background information about Thomas Edison (or provide a quick verbal summary to remind students that Thomas Edison was a scientist and inventor known for his work with electricity, light bulbs, and batteries). 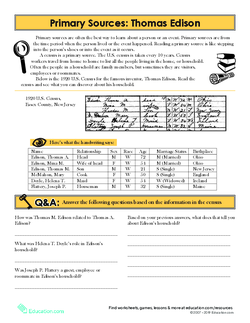 Use a document camera to display the primary source document on the Primary Sources: Thomas Edison worksheet. Read the information on the chart aloud (note: you do not need to complete the questions on the worksheet). Ask students what they noticed about the primary source document (the census). Give them a moment to talk with a seat partner, then call on volunteers to share their observations. Prompt students if needed (e.g., the document was handwritten, it provided numbers and facts). Use a tablet or computer to display an online article about Thomas Edison's later life, like the section of his biography entitled "Later Inventions & Business" (see suggested resources). Ask students what they noticed about the secondary source. Give them a moment to talk with a seat partner, then call on volunteers to share their observations. Prompt students if needed (e.g., the article is written in narrative form, it includes dates and facts). Draw a large Venn diagram on a piece of chart paper. Label one side "primary source" and the other side "secondary source." With the class, compare and contrast the two types of sources. Record features that were discussed in class and invite students to generate additional ideas to fill in the Venn diagram (e.g., they both provide facts, a primary source can be written as a list or chart, or a secondary source can be written as a narrative). Add specific examples of facts to the Venn diagram (e.g., "Primary Source: Thomas Edison was 72 years old in 1920," "Secondary Source: Thomas Edison was born in 1847."). 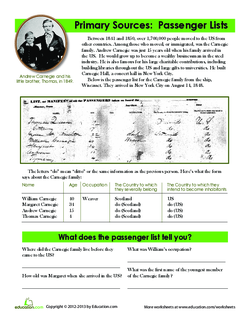 Hand out the Primary Sources: Passenger Lists worksheet and explain that it is a primary source document. Simultaneously, display an online article (secondary source) about Andrew Carnegie's childhood, like the section of his biography entitled "Early Life" (see suggested resources). Hand out a sheet of paper and tell students to draw a Venn diagram (or provide a printed one). Instruct them to fill in their own Venn diagram comparing the two sources of information they read about Andrew Carnegie. As a class, discuss the two sources and the differences between them. Ask students to reflect on why there is conflicting information in the two sources (e.g., his age in 1848). Ask students to consider which source is more trustworthy and what they can do to figure out which source is correct (e.g., look for additional sources to confirm the disputed facts). Pre-teach challenging vocabulary that students will encounter in the primary and secondary source documents (e.g., "census," "philanthropist"). Provide dictionaries for students to use as resources during independent practise. Have students write a report about Thomas Edison or Andrew Carnegie using the sources studied in class. Encourage students to cite quotes from each source. Demonstrate how to compile a bibliography and have students create one for their own written research report. Encourage students to look for additional primary source documents at their local library. List three features of a primary source document and three features of a secondary source document. Name two things that primary sources and secondary sources have in common. Write one sentence about how you can use primary and secondary sources. Collect student responses. Randomly select a few student responses to read aloud. Discuss the responses as a class and correct misconceptions as needed. During the discussion, have students give a thumbs-up if they agree with a response or raise their hand if they have a correction or addition to suggest. What is valuable about primary source documents? Are there any problems/challenges with using primary sources for information? What about secondary sources? Are there topics in which primary sources don't exist? People or events that are not represented by primary source documents? Which type of source is more trustworthy? Why? Which type of source would be easier to use when doing research? Why? Adaptations are often used to retell old stories in new mediums. However, not all adaptations are exactly like their originals. This lesson helps students understand how inclusions and omissions can change a story. 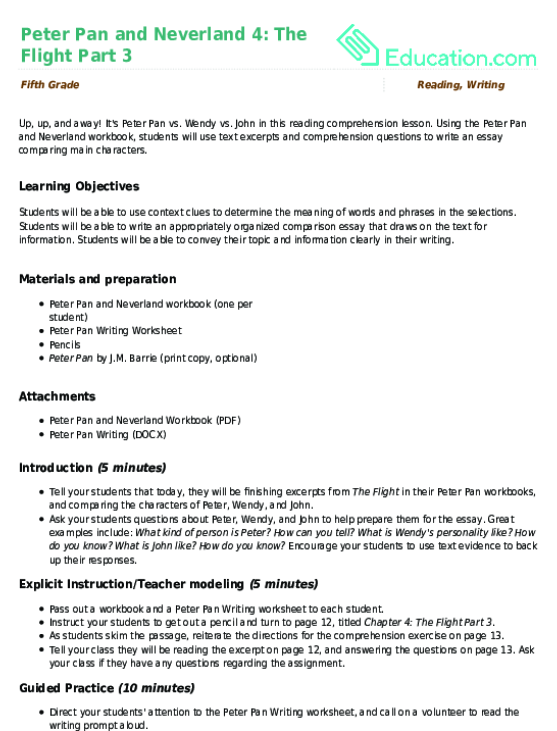 It's Peter Pan vs. Wendy vs. John in this reading comprehension lesson.